Since I was a teenager, I’ve struggled with my skin. I suffered with terrible acne and when I look back now, I should have taken better care of it with a skincare routine and not tried to cover it with foundations and powders. It made it look a million times worse but to me, I just wanted the redness to go away. I always said to myself that if the physical spots went, I’d be happy with the redness because I could cover that. It turns out that it’s not as easy to cover as I thought! 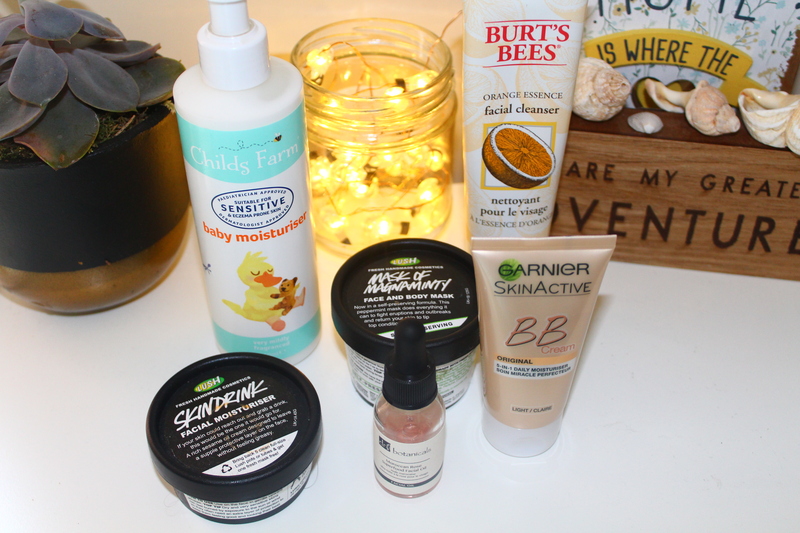 Burt’s Bees orange cleanser – When I still received my Glossybox, I used to leave feedback for the products and box I’d gotten and they’d give me credits in return. I had about £8.50 when I cancelled so I thought I’d use them to get a new cleanser. Burt’s Bees have always been a favourite of mine and this cleanser just did everything I needed it to. It has a strong orange smell and it doesn’t lather up as much as I’d like it to but it clears my face of any oils or leftover makeup so I think I’d buy it again. Child’s Farm baby moisturiser – this is designed specifically with babies in mind and is suitable for newborn skin and even for babies with eczema. I bought it after seeing that it can help eczema in a big way, basically getting rid of it in some cases and while mine still hasn’t gone, the itching is definitely less when I’ve used it. It contains shea and cocoa butter which gives it a mild scent and for a 250ml bottle, it’s £3.99 in Boots. I actually went and bought another bottle when we were holiday because I’d left mine at home and the itching was unreal! Garnier SkinActive BB Cream – I only bought this on Sunday because I need to ditch heavy makeup while my skin is having a flare up. As we all know, foundation and powders just don’t sit nicely on dry skin. I would never have thought to use a BB cream a couple of years back but I love this one. It’s not too dark and my skin feels lovely and soft all day. It’s currently on offer in Superdrug for just under £10. Lush Skin Drink moisturiser – I bought this when the skin on my face was really dry and I needed a moisturiser which was going to work deep into the layers of my skin and Skin Drink was one of the ones I was recommended. The smell isn’t the best but it does the job. I also use this about twice a week because it is quite heavy but it does the job. I’ll apply it before I go to bed and then it gets the chance to really work and sink in, I found that if I used it in the morning that my makeup wouldn’t sit right . Lush Mask of Magnaminty – I’ve been a fan of Lush for a long time but I never really branched out beyond the bath bombs and bubble bars. But I’ve seen so many people rave about this face mask that I thought I’d give it a go. The smell from it is so minty and fresh and it contains so many ingredients within it to help soothe and calm red and irritated skin. I usually put it on between once and twice a week, depending on how my face is feeling. I’ll apply it about 10 minutes before I get in the shower and that gives it time to soak in before I wash it off. And because of the evening primrose seeds and aduki beans, it can also be used for a quick exfoliator when I don’t have the time to leave it on. I bought a 125g tub for £6.95 at the end of March and I’ve still got around half a tub left. Dr Botanicals Moroccan Rose Superfood Facial Oil – This was part of the first Glossybox I received back in January and I’ve still got some left. I absolutely love this, not only is it vegan but it contains all natural ingredients to help brighten and rejuvenate skin. I don’t want this to run out because I love it so much but I can’t justify spending £29.90 on a bottle this size. I use it sparingly and the smell is just amazing. The only thing I’m missing at the moment is a good toner because my pores aren’t the best. I’ve heard good things about the Body Shop Seaweed range but if anyone else has any recommendations, then please let me know! Also share your skincare routines…I’d love to add some more products to my routine, especially when these ones run out.